One of my favorite BERNINA “toys” is the Needle Punch Accessory Set; perhaps because using it is so much like coloring with crayons, or maybe because it provides nearly instant creative gratification. 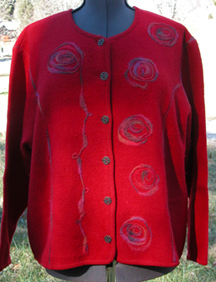 Just imagine: pull a boring old sweater from the back of your closet (or the $2 rack at the local thrift store), add a handful of yarn/fiber/fabric scraps, play for 30 minutes, and end up with a one-of-a-kind designer sweater! 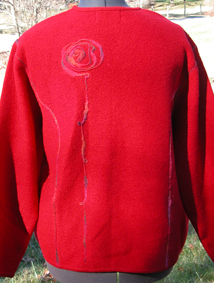 I had this red sweater and leftover yarn in my office for several weeks before I decided what to do with them. Every afternoon I’d place the yarn in different positions until one day – after seeing someone wearing a coat with large felt dots – I started moving it into tight swirls. The yarn tail reminded me of a stem, and so these roses were born.